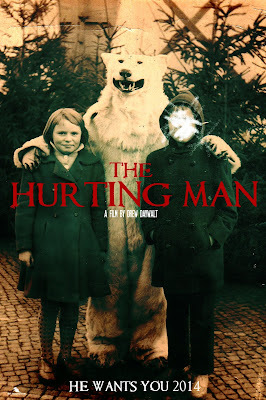 Horror writer/director Drew Daywalt (CHILDREN SHOULDN’T PLAY WITH DEAD THINGS, DEATH VALLEY, BEDFELLOWS) has just inked a deal with producer Eric B. Fleischman of EBF Productions (RITUAL, TWO-BIT WALTZ) to direct the horror feature THE HURTING MAN, based on Daywalt’s script. Indie horror luminary Larry Fessenden (Habit, The Last Winter) is attached as Executive Producer. THE HURTING MAN follows the story of a police officer who tragically finds his family murdered after a failed 911 call and now must work to save their souls from a demonic boogieman haunting his childhood home. Says Fessenden, "There's a certain kind of genuinely terrifying old-school-campfire scare that Daywalt gets right in his Fear Factory gems and I can't wait to see him nail those chills in a long form film." Film goes into production this fall. Daywalt, Fleischman & Fessenden are not commenting on cast yet, but promise something wonderful is in store for horror fans as well as everyone else. While little else is known about the project, we have been informed from close sources that the terrifying boogeyman in this film will inspire iconic halloween costumes for years to come. After three years of creating dozens of the most terrifying, award-winning short films in the world, Daywalt Fear Factory is producing its debut horror feature, THE PASSENGERS. THE PASSENGERS tells the story of a young trucker and his wife who are terrorized by the tortured spirits attached to a load of antiques that the couple has been commissioned to haul cross country. The film is being directed by Drew Daywalt who also wrote the screenplay. Edin Gali (MAD MEN, HEMMINGWAY AND GELLHORN) stars with Courtney Halverson (DEATH VALLEY, RED CLOVER). Jeff Farley is co producing and has signed on to do the extensive physical FX. "We've been waiting for this opportunity for a couple years now. And since we're being financed through private investors, my team and I have the creative control to tell an intelligent, terrifying story. We're finally getting to make the film we want to make, in the way we want to make it. The plan is simple; tell a good story that scares the hell out of everyone." Filming will take place in Massachusetts, New York, Ohio, Missouri, Utah, New Mexico and California. Wow, it's been almost five years since we did our interview with Paul Campion. We spoke with him after he made his awesome short films, "Eel Girl" and "Night of the Hell Hamsters", both of which screened at indie horror film fests. If you go to Youtube, you can find clips from both... I'm not sure if they're on there in their entirety. In any case, Campion's feature, "The Devil's Rock", was not only a great film, it was nominated for 3 awards at the New Zealand Film Awards. Here's the press release and if you want to check out our interview from four and half years ago, here's the link. Paul Campion’s The Devil’s Rock has been nominated for three awards at The Sorta Unofficial New Zealand Film Awards 2012. The Sorta Unofficial New Zealand Film Awards is organised by Hugh Sundae of nzherald.co.nz and Ant Timpson, and presented by the New Zealand Herald and Rialto Channel. Nicknamed the Moas, the awards recognise all films filmed and produced in New Zealand and celebrates all New Zealand films, whether feature or short. Synopsis: Set in the Channel Islands on the eve of D-Day, two Kiwi commandos, sent to destroy German gun emplacements to distract Hitler’s forces away from Normandy, discover a Nazi plot to use the occult to win the war. The awards ceremony will take place on Tuesday 4th December at The Civic Wintergarden, and will be streamed live on nzherald.co.nz. Shiva has been in the entertainment industry since 1988, working with theatre and performance art productions before moving into film and video in 2008. While she's best known for her work in practical F/X for stage and screen, she also has experience as an art director, stage manager, costume designer, set decorator, video editor, screenwriter, and producer. Predatory Moon is a unique werewolf story that takes place near the Florida Everglades. Zoologist Kyle Reading suspects that the violent bear attack he's investigating was actually the work of a far more sinister creature. Acting on his suspicions, he begins to take a closer look at Dean, the sole survivor of the incident who is displaying some very unusual behavior. Unfortunately for Kyle, there is someone watching him very closely too. Someone who sees an advantage to having a stranger in town who cries “werewolf”. Predatory Moon is a very old-school style horror film geared toward fans of the genre. This production will be shot on location in Florida in 2013, utilizing a talented cast and crew of local film- makers, natural locations, and 100% practical effects. Jacob Cooney, friend of Dead Harvey, sent us a link of his most recent project to share. It's a short called "Rocco" and revolves around the relationship of a man and his muppet who aren't on such good terms. 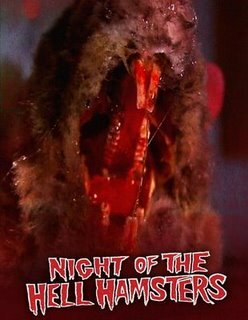 Several friends of the main character, muppeteer Nathan Danforth are revealed slain in the beginning, then Danforth opens a small treasure box and "Reading Rainbow" style sparkling lights fly around psychotically and transform into the vicious muppet Rocco. ROCCO - a short film from Jacob Cooney on Vimeo. For more information on filmmaker Jacob Cooney and his work, visit his website at: www.jacobcooney.com. Also worth mentioning again is a short entitled "The Frolic" and we interviewed Cooney about it. It is further proof of Cooney's talent as a filmmaker and features some very impressive acting and directing. You can listen to that interview by clicking here. "Director Dan Riesser has created an instant cult classic with Night of the Punks." "A fun-filled grue-gala with awesome F/X and a rad sense of humor." 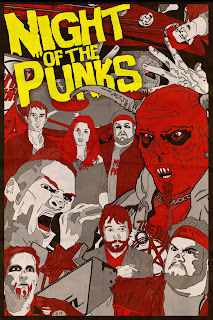 Just in time for the Halloween season, Irrational Films has made Dan Riesser's horror-comedy short film NIGHT OF THE PUNKS available for online streaming via YouTube. In Night of the Punks, small town punk rockers The Brain Deads have their first out of town show, but there are a few problems: the venue is deserted, the promoter is a creep, their bassist has gone missing and the only kids in the audience turn out to be bloodthirsty punk rockers from Hell. Drawing inspiration from Return of the Living Dead, Night of the Demons and the Evil Dead series, Night of the Punks is a blood-splatted love letter to '80s horror cinema. The cast includes industry veteran Luke Edwards (The Wizard, Little Big League, Newsies), sketch comedian Nick Munday, professional wrestler Vic D. Vine and L.A. horror punk band Murderland. The short has been Official Selection at more than 25 film festivals around the world and took home numerous awards and accolades. Director Dan Riesser comments, "Making Night of the Punks and taking it to festivals was an amazing experience, and I'm glad everyone now has a chance to catch it on YouTube." 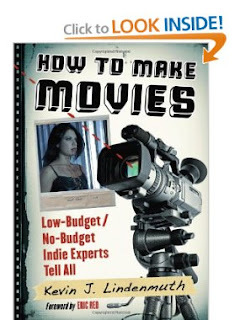 Riesser plans to turn the self-financed, 19-minute short into a feature film. The script is complete and the project is currently seeking funding. In the interim, Riesser is focusing on his feature directorial debut, Stomping Ground. Billed as a scary comedy about love and Bigfoot, the movie enters production this month. For more information on Night of the Punks, visit its official website at NightofthePunks.com. Hey guys, thought I'd share the press release that I received for Jay Woelfel's upcoming flick, "Season of Darkness". You have to like that cast... Tim Thomerson, Tiffany Shepis? Also, if you have a press release for your film or you're looking for some promotion, please let us know. More than happy to promote indie horror! Director Jay Woelfel (Closed for the Season) returns to horror with a psychological tale of mistaken identity. Woelfel’s Season of Darkness is a story that focuses on a protagonist who is an escaped mental patient. He finds release daunting and strange. Once free, the public believes Dwight is actually a successful motivational speaker named Artemus Finch. Unsure of what is real and what is imagined, Dwight eases into his new role as Finch. But, there is a price to pay for Dwight’s new fame and loving wife. Shades and faceless figures pursue him at every turn and they threaten Dwight’s love for Ellen. Will Dwight succumb to madness, or will he face his troubles head on? Season of Darkness stars Richard Hatch (“Battlestar Galactica), Tiffany Shepis (Night of the Demons) Tim Thomerson (Trancers, War Wolves) and Nick Baldasare as Dwight (Beyond Dream’s Door, They Bite) in a classic tale of horror. 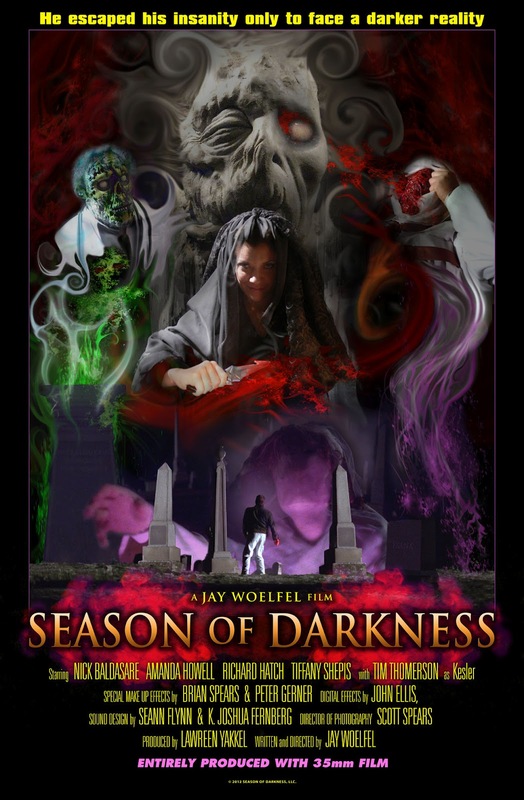 To pay homage to past tales of the macabre, Season of Darkness was exclusively shot on 35mm film to enhance the dark and moody atmosphere of the film. This is a tale of true psychological horror few will forget. Makeup/special effects: Brian Spears, Peter Gerner, Beki Ingram and John Ellis. Cast: Nick Baldasare, Amanda Howell, Tim Thomerson, Richard Hatch and Tiffany Shepis. *this title is the most recent collaboration between Emmy Award winning collaborators: Jay Woelfel and Scott Spears. I've had various meetings with different producers and industry folks over the last little while about some projects that we're trying to get off the ground and what I've found to be very interesting is how much clout is given to online status. I guess it makes sense, it's something that's measurable. What's crazy is... and I don't mean to take anything away from the festivals, they're very important... but if your video on Youtube has over 1 million hits, you're going to get noticed faster than if you win best picture at a film festival. Not only that, your ranking on imdb matters, anything on Youtube matters, how many unique visitors your site gets, whatever. Long and short, if you've got Google juice, you can use that to your advantage and it can open up doors. The truth is, how we use the internet for entertainment purposes is still in it's infancy. Sure, the internet can deliver a film to you through Youtube, Netflix, Amazon, Hulu, whatever... but that's just a delivery mechanism. How about really using all the tools that are out there? Facebook, Twitter, Blogs, etc. Now, what if we actually start integrating these? We're starting to see experimentation and when one of these projects rises to the top and gets noticed, we could see a revolution in how online is used for entertainment. So, who's doing this? Well, I received an email from James O'Connor about a month or two ago. He's part of a new interactive web series called THE DEAD FEED. The first episode aired a while ago, on August 17th, but a new episode has aired every two weeks. The series follows three groups of people during the start of a zombie apocalypse and it's truly interactive... it utilizes Facebook, Twitter and users can upload Vlogs and more. If you want to check it out, their Youtube channel is called "The Deadfeed" or you can just go to www.deadfeed.com and watch there. When there, you'll also find all the links to the characters Facebook pages, Twitter feeds, etc. The teaser video is embedded below. It's a very cool idea and we wish them the best of luck. For all those in the LA area, here's a must attend festival for you... Carnival of Darkness 3 on October 24th. If not for the screenings or the collectibles, because Drew Daywalt, good friend of Dead Harvey, will be on a live panel. Here's the press release - make sure you check it out! HOLLYWOOD, CA - October 1, 2012 - Filmmaker Alex Bram presents the most promising new voices in horror at the third annual Carnival of Darkness Film Festival. The most haunting and disturbing horror/sci-fi short films from across the world will be presented on a THX Authorized, state-of-the-art screen at LA Film School this October 24th. The theater lobby will be set up like a twisted art gallery and horror related collectibles, graphic novels, DVD’s and T-Shirts will be available. Attendees will enter a funhouse of mysterious events and surprises, freaks, performers and artists. Selected filmmakers and casts will get to walk the “Blood Red Carpet” along with industry heavyweights and notables from the horror/sci-fi communities. 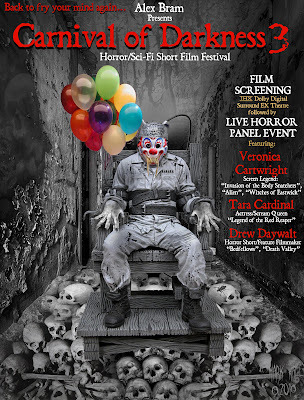 The doors open at 6:30 p.m. and the Red Carpet starts at 7:00 p.m.
“Carnival of Darkness is extremely proud to be able to welcome true master actor Veronica Cartwright to this year’s festivities,” said Bram. “Alternating between television and big screen movies, Veronica has appeared in such films as the remake of Invasion of the Body Snatchers (1978) and the horror classic Alien (1979). “Tara Cardinal is the daughter of a psychic and a musician,” said Bram. “She frequently appears in horror and fantasy films and likes to perform her own stunts. Look for her film Legend of the Red Reaper, (2012) coming soon. Cardinal is currently filming, Spreading Darkness, (2013) and has several projects in the works. Drew Daywalt’s first Online horror short film Bedfellows earned a million viewers with a week of its launch. Later, the world’s leading short horror film creator, enjoyed millions of hits to his 2010 horror web series Camera Obscura. 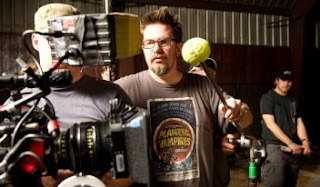 Most recently Daywalt directed three episodes of MTV’s new horror comedy TV series Death Valley, and wrote the screenplay for the remake of Children Shouldn’t Play with Dead Things for George Romero, now set up at Anchor Bay.